I’ve been madly sewing for Costume College over the past few months, and I finally have enough free time again to blog about my projects and show you all what I’ve been up to lately. 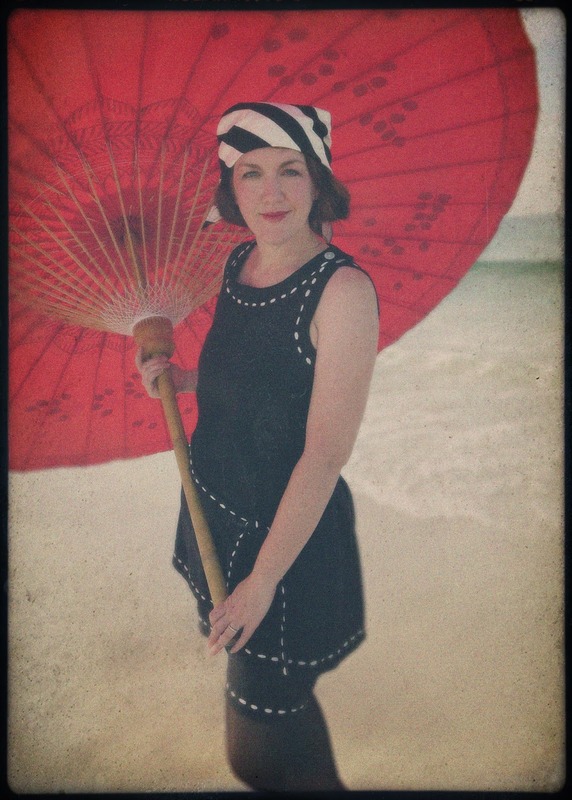 I’ll start by sharing the most summery of my new outfits – a late 1910’s/early 1920’s bathing suit. I think these bathing suits tend to look pretty silly to our modern eyes, but they are comfy and fun and so easy to make, and I thought it would make a great low-stress costume to wear to the Costume College pool party after a long day of traveling. My suit is not an exact copy of any one historical outfit, but the basic long tank top and boxy shorts were hugely popular in both photos and fashion plates of women (and men!) from the years around 1920. 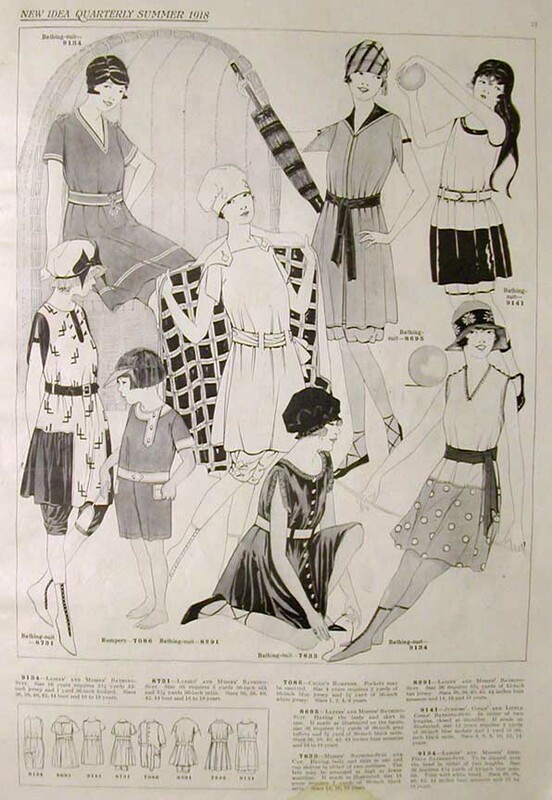 You can see a wide variety of similar styles on my historical bathing suit Pinterest board. Black was one of the most popular colors for bathing suits, and like most of the surviving examples, I made mine from wool. I had a hard time finding wool knit for an affordable price, but I lucked upon some wool mommie cloth, which has a slightly stretchy crepe-like weave that worked perfectly for my project. Then I decorated the edges with white rayon soutache. I threaded the soutache onto a large eye tapestry needle, then sewed it directly into the fabric by using a big running stich around the edges. 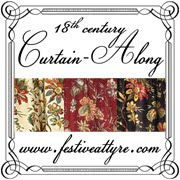 The weave was loose enough that the soutache slipped through holes in the cloth with no trouble at all. You can see a similar treatment on bathing suits like this one. 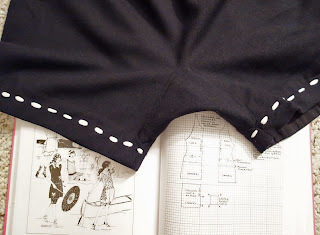 I drafted my own pattern for this suit after consulting several 1920’s swimsuit pattern diagrams in the book Women's Wear of the 1920's: With Complete Patterns . I was very doubtful that the shorts pattern from that book would work for me - it’s just one rectangle for the front, one rectangle for the back, and a square gusset inserted into a slit for the inner legs and crotch - but it actually worked quite well. 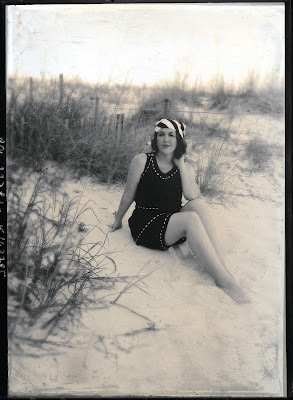 Many of the 20’s bathing suits had the shorts attached to the top, but I made mine separate and used elastic at the waistline just to make it less fussy. Or if you wanted an even easier alternative, this type of suit would also be very easy to fake with a modern sleeveless blouse and shorts pattern. These early bathing suits are pretty plain on their own, so accessories go a long way to creating a more historical look. 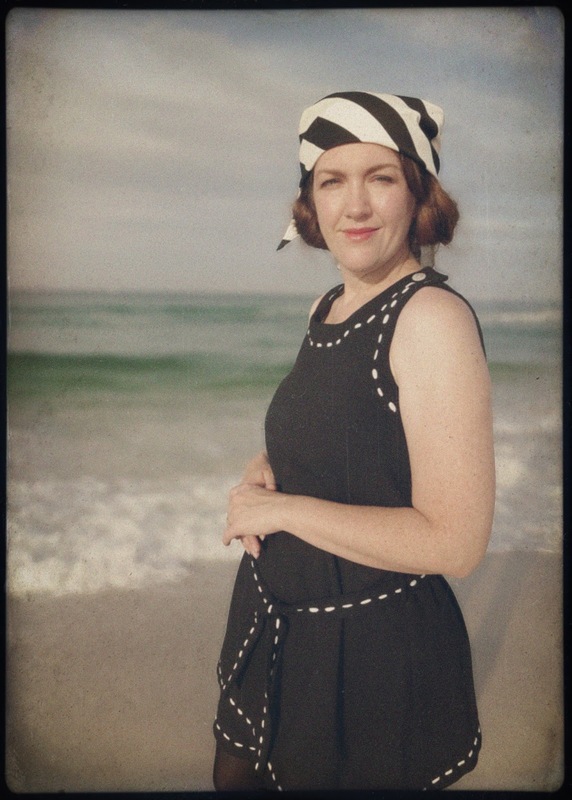 The vast majority of women in 1910’s and 20’s photos of bathing suits are wearing some sort of cloth cap or bandana to cover their hair, so I just hemmed a large triangle of striped cotton to wear for my own beachy headwear. 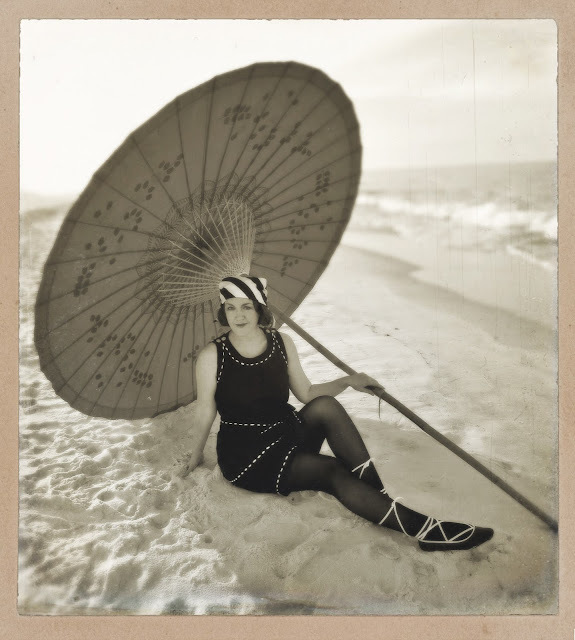 I also loved that so many of the women in the earlier photos were wearing black tights with their bathing suits, so I took some photos both with and without the tights, but I think I like the look of tights better just because it is more "old timey" looking. I was also curious to see how it felt to wear hosery on a beach or in water, but it was really pretty nice. They offered protection from the itchy sand, and having wet tights next to my skin kept me much cooler than having the sun on my bare legs. But it was also fun to take the tights off and get a more modern, later 20's look. After having the tights on first, I have to admit that bare legs felt quite scandalous! For my beach shoes, I stitched some soutache around the edges of a pair of cheap ballet flats from Target and added some ties to wrap around my legs. It was an easy alteration, and they held up well to wading through the water. 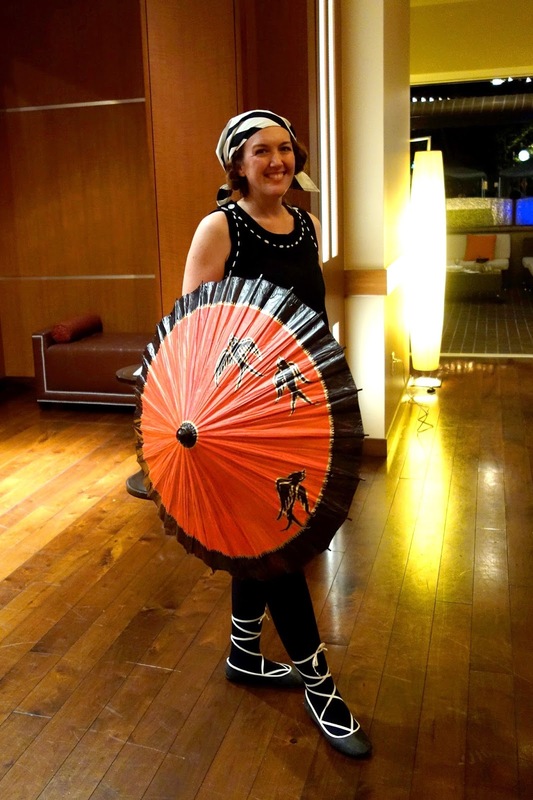 But my favorite accessory of all was my parasol. The big one in my beach photos is made of canvas and bamboo, and it was sold at World Market a few years ago. It is HUGE and heavy, but I loved how similar it looks to the beach umbrellas seen in some period photos, like this famous image by Jacque Henri Lartigue. I tried to take some similar photos, but it was harder than I thought it would be to look glamorous while running back and forth to take pictures with a tripod and automatic timer in the soft sand. My umbrella kept rolling away and the waves would catch me off guard, so I'm sure I made quite a curious and memorable sight for the tourists watching me from their balconies at the condo! I obviously couldn't carry such a huge umbrella around Costume College, so I painted some swallowtails on a cheap paper parasol in a design similar to the parasol in this fashion plate. It's not nearly as exciting as my big umbrella, but it definitely helped my outfit feel more complete. The black and white is pretty severe without a little dash of color. So that's pretty much it for my first new Costume College costume. I've uploaded all of my pictures from the weekend to this flickr album if you want to see some spoilers about what I'll be blogging about over the next month, and I also have another album with a few more of my beach pics. 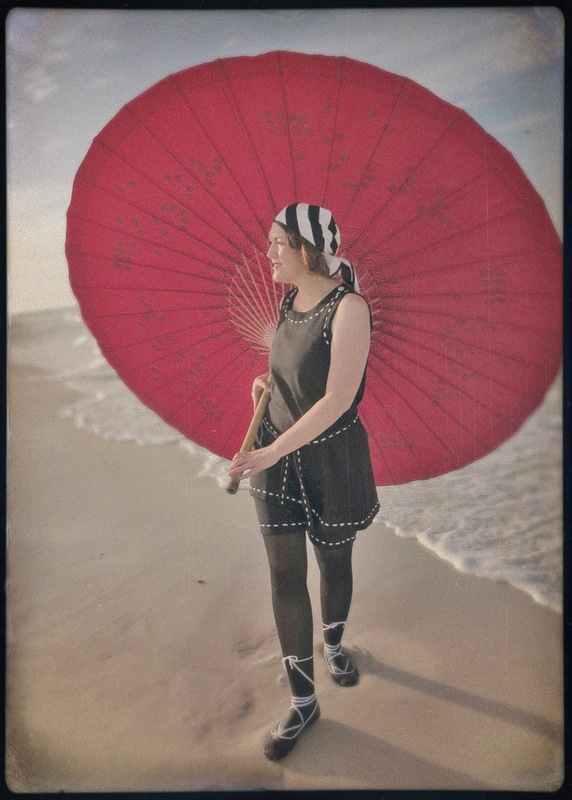 I also had fun indulging in my other hobby and turning some of my favorite shots into faux-autochromes and other antique photo fakes. I think my favorite part about Edwardian and 1920s costuming is getting to Photoshop all the pictures when I'm done! 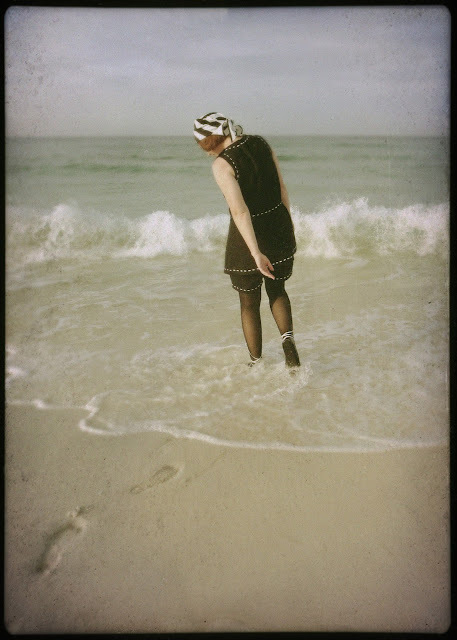 Autochromes are the best, and I always love getting new inspiration by looking at the real ones - aren't they gorgeous?